OSSCC fosters individual and community health through creative use of public space. OSSCC organizes FREE, family-friendly community events which temporarily divert car traffic and open the roadway for people to bike, walk and play in a safe, fun and car-free environment. Events include robust and interactive experience focused on recreation and education: dancing, arts and crafts, hula hooping, music and performances, mobile libraries, and educational outreach booths hosted by local community organizations and sponsors. OSSCC partners with a variety of public, non-profit and private organizations, including neighborhood and community groups; environmental, health, and bicycle/pedestrian advocacy organizations; parks and recreation and health departments; and variously focused transportation agencies. Our vision is a sustained program of repeating events in diverse locations of Santa Cruz County. OSSCC was launched in March 2012 by founder and director, Saskia Lucas. Inspired by the national and international movement of Open Streets events and by personal experiences of the joys and benefits of active recreation in car-free roadways, she decided to begin a local initiative. The first Open Streets event in Santa Cruz County took place in October 2012 on West Cliff Drive in the City of Santa Cruz. This inaugural event was an overwhelming success with over 9,000 people attending. The second Open Streets Santa Cruz in October 2013 and again attracted over 9,000 participants and generated enthusiastic support for continued events. In October 2015 the event returned thanks to first-ever sponsorship by the City of Santa Cruz. This commitment of ongoing support from the city ensures that people can count on this popular annual event taking place into the future. 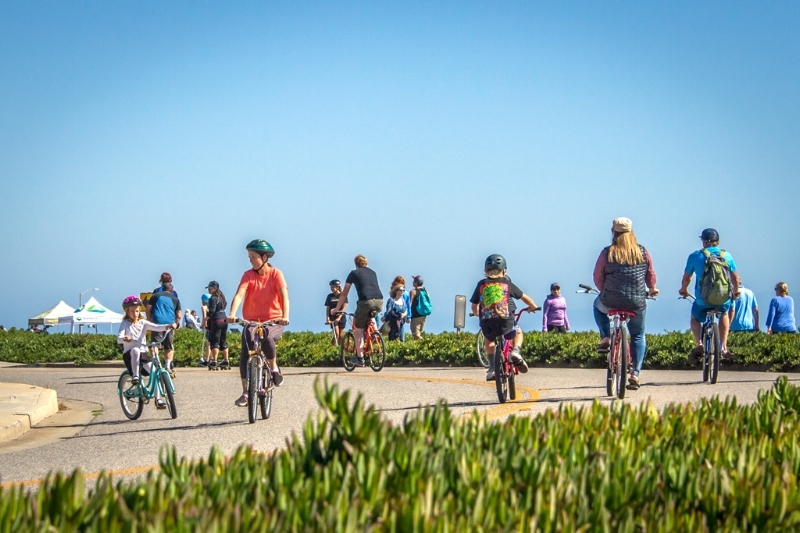 Building on early achievements the program soon expanded to other parts of Santa Cruz County with new Open Streets events in the cities of Capitola (May 2014) and Watsonville (May 2015). These successful events drew thousands of people and generated strong support for more Open Streets. In April 2016 Saskia stepped down as director and OSSCC became a program of Bike Santa Cruz County. OSSCC is part of a growing movement of Open Streets events in cities in the US and around the world that temporarily transform city streets into parkways where people can enjoy active outdoor recreation in a safe and fun car-free environment. There are now over 100 cities with Open Streets events in the US alone. “Many North American open streets initiatives draw inspiration from those held in Central and South America, where they are called “ciclo-vías.” The term, which translates to English as “bike path,” was coined in Bogotá, Colombia, a city that began experimenting with its model Ciclovía initiative in 1974…With approximately 120 km (70 miles) of streets open for non-motorized activity each Sunday and holiday, and weekly participation rates that can exceed one million, Bogotá is the de facto leader of this growing global movement. However, before there was Ciclovía in Bogotá, there was “Seattle Bicycle Sundays,” a car-free initiative connecting several parks along a 3-mile stretch of Lake Washington Boulevard. Launched in 1965, Seattle’s on-going effort predates Bogotá’s Ciclovía by nearly a decade. Additionally, Seattle’s Bicycle Sunday promptly inspired similar initiatives in the parks and parkways of New York City (1966), San Francisco (1967), and Ottawa (1970), making open streets a decidedly North American phenomenon.